I finally feel like we have made a serious dent in our progress on the nursery, this weekend we tackled our last large project for the space. Finally we can start moving things in and putting this room together! 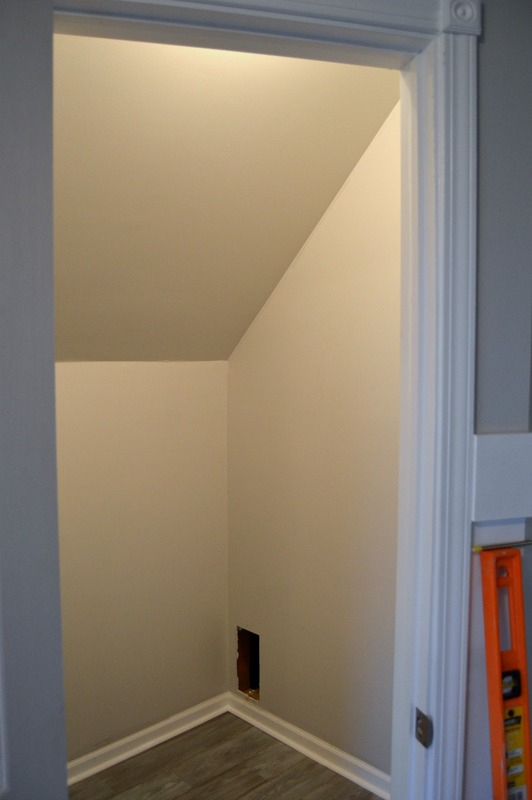 Last week Martin wrapped up the floor project by installing the quarter round trim, caulking and painting which really helped the room start to feel like a finished space. The last major thing that needed to be done was getting some organization in the closet. Lets quickly remember where we came from. 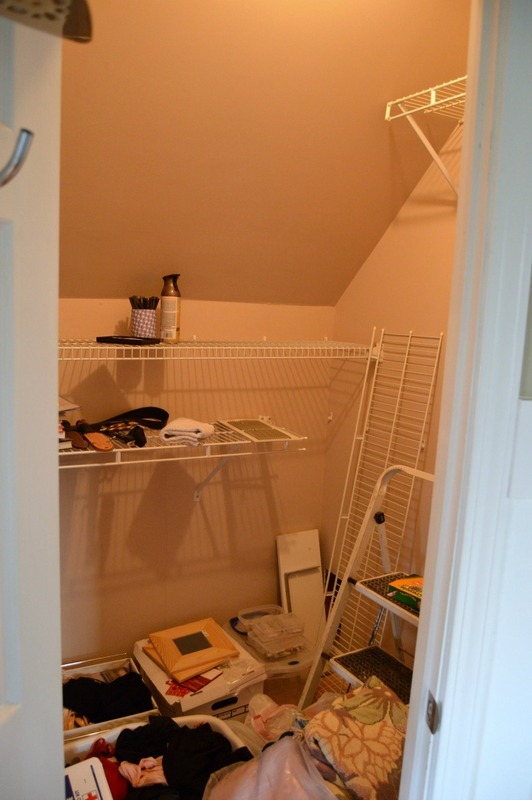 This closet wasn't too pretty at the start of our project. It was the dumping ground for most things as we were cleaning out the room. It was also outfitted with wire shelving that was slowly falling off the wall piece by piece ever since I had bought the house. Not pretty! A fresh coat of paint, and a blank space and we were ready to go. Ignore the missing vent cover, it's on my shopping list. But already so much better. And you can see with the trim down how the floors are finished off and everything is starting to feel like a real room. 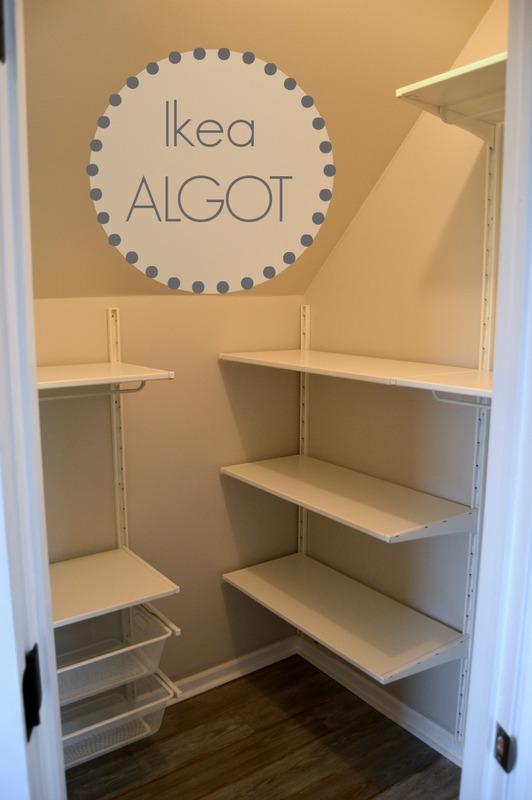 For this closet we decided to go with the Ikea ALGOT system. 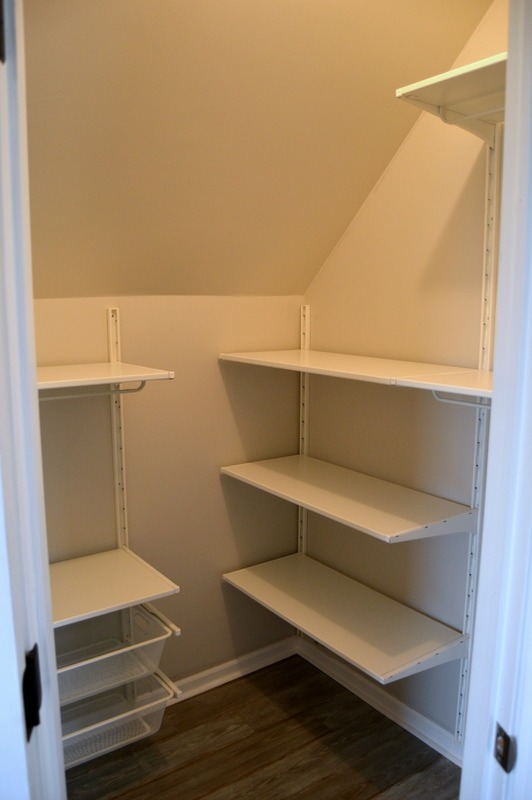 In my master closet I had used the AKRUM system, which is similar but has since been replaced with the ALGOT. I love that it's completely customizable, for a fraction of what you would pay at most other retailers. A few weeks ago we made a trip to Ikea so I could check out in person all the parts/options available. Then once home I took me dimensions and mapped out a solution that would work well for us. There were definitely a few drafts done, and even the final draft of what ended up in the closet is slightly different then the final draft I went to the store with. Once I had decided on my layout I made a shopping list of all the parts that we needed which made getting through Ikea on a Sunday a little less crazy, but still that store was packed! It probably had something to do with the cold rainy weather we were having, but still I haven't seen it that busy in a long time! We initially spent about $200 on all the parts, but after some last minute installation changes we ended up returning about $40 of extra parts that we didn't end up using leaving our grand total around $160. 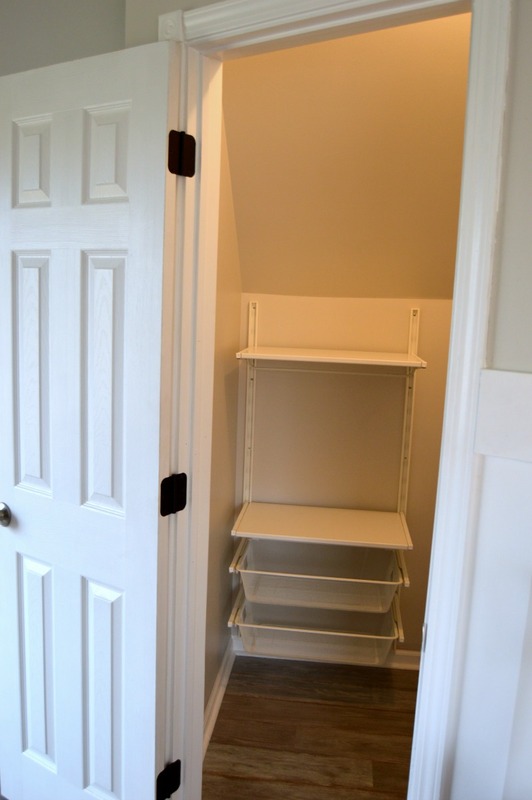 Once you're home you'll have everything you need except for the hardware to secure the vertical brackets to the wall. We just picked up some heavy duty anchors at Home Depot, and got to work. The hardest part is just making sure you get all of the vertical brackets level and secure to the wall at the right spacing. Once those are in the shelves and components literally just snap into place. We got the whole thing installed in about 2 hours on Sunday night. I am so happy with how it turned out and all the storage we have. Now it's time to load it up with all the baby goodies that have been floating around our house. Something else that we've also slowly been doing around the house is upgrading all the hinges on the doors. The old rusted brass ones are being replaced with some nice new oil rubbed bronze ones. Several months back I picked up a bulk box of the hinges on Amazon, enough for all the doors in our house for about $25. We've probably replaced them on about half of the doors in the house, slowly they will all get there. Now we just need to get some door knobs to match. But first we have to finish the rest of the nursery!